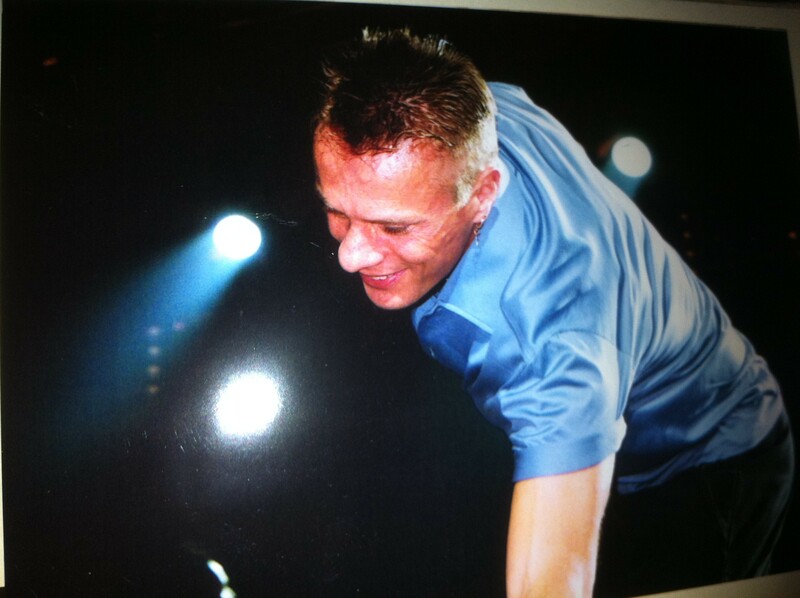 Home » Larry Mullen » Happy Birthday Larry Mullen Jr! Today is not a holiday to me because it’s Halloween. 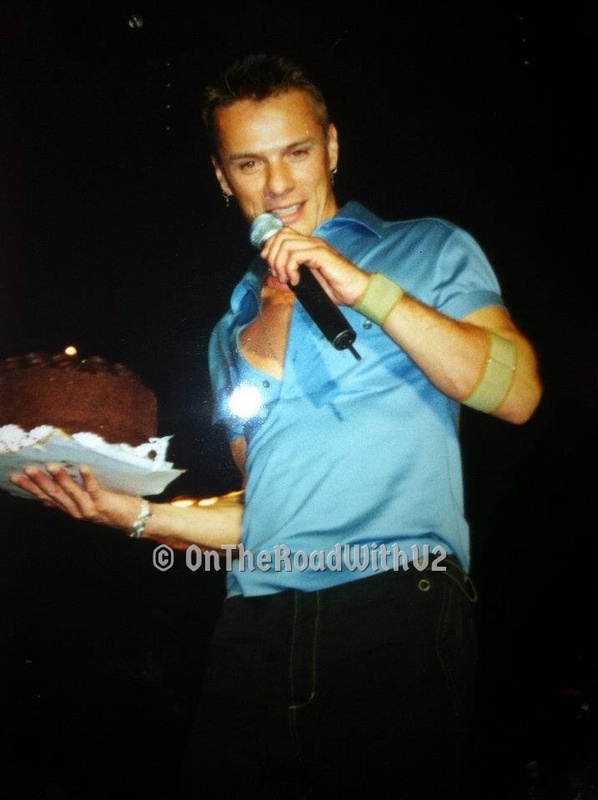 Today is a holiday to me because it’s Larry Mullen Jr’s Birthday! 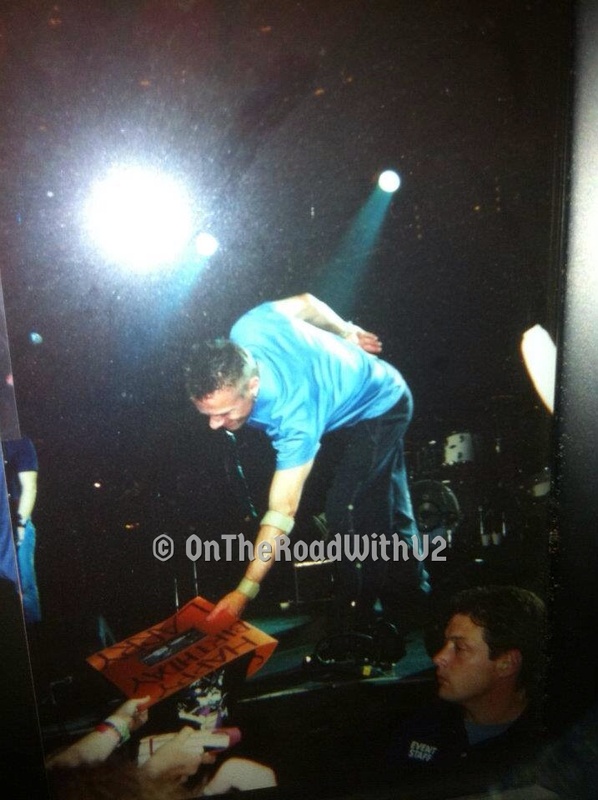 It is also the anniversary of my favorite U2 show ever, Larry’s 40th Birthday show in Providence, Rhode Island on the Elevation Tour October 31, 2001! That was my 40th U2 show and I have seen 50 since, but none will every surpass that show – ever! Let me take you back 14 years and what I wrote about that magnificent experience. Immediately following the first concert in Providence on October 30th, Paola and I got in the GA line for Larry’s 40th Birthday concert the next day. I was number seven in line. Tasha had driven up and met us after the show. We got some food, then Tasha slept in the hotel while Paola and I slept outside in the GA line. Even though it was 30 degrees on that cold sidewalk in Providence in late October, we actually got about five hours of sleep. We woke up at 8am the morning of October 31, 2001. We went up to our warm hotel room for a couple hours and had some breakfast. We stayed in the GA line all day without leaving, except to take a shower around 3:30pm. 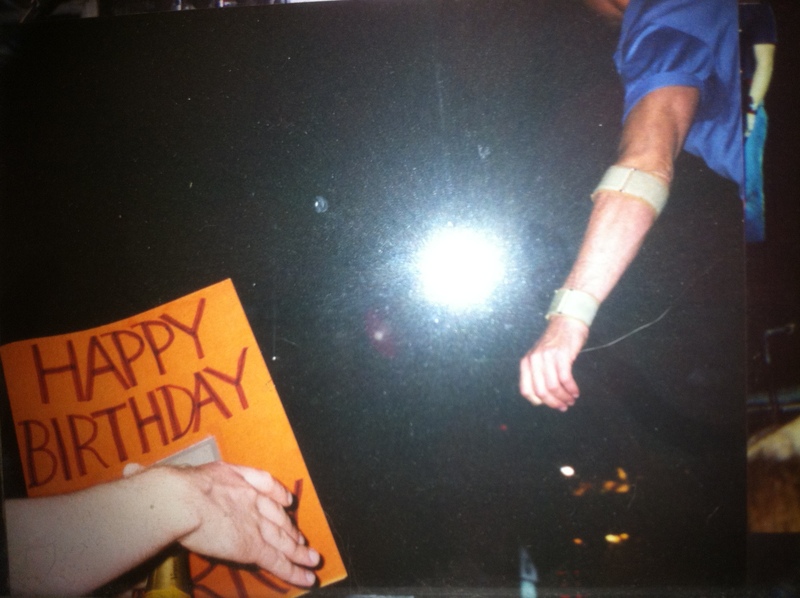 I made a huge orange (my favorite color) Birthday Card for Larry and had everyone in the GA line sign it. I put my name and email address on the back just in case. I was optimistic back then, and maybe a little delusional. I had also brought an Elvis Harley motorcycle shirt to give to Larry as a birthday present. Standing at the front rail between Bono and Adam, Tasha, Paola and I wore our “Larry Mullen Band” shirts Paola had made for us. 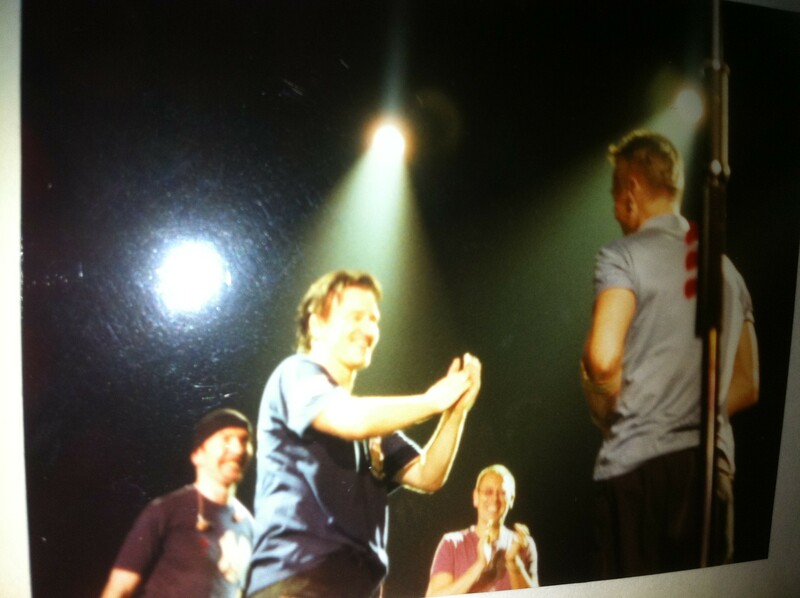 I held up the birthday card for Larry as U2 walked on stage, but I don’t think Larry saw it. There were many signs that night including one saying, “Bono let Larry sing,” but that did not happen. During “Elevation,” Bono sang, “Celebration” then said, “Happy Birthday.” After “Stuck in a Moment,” Larry’s 40th birthday celebration began. Bono led the audience in a chorus of “Happy Birthday” to Larry. Then a birthday cake was brought out, and Larry pretended to throw it out into the audience. 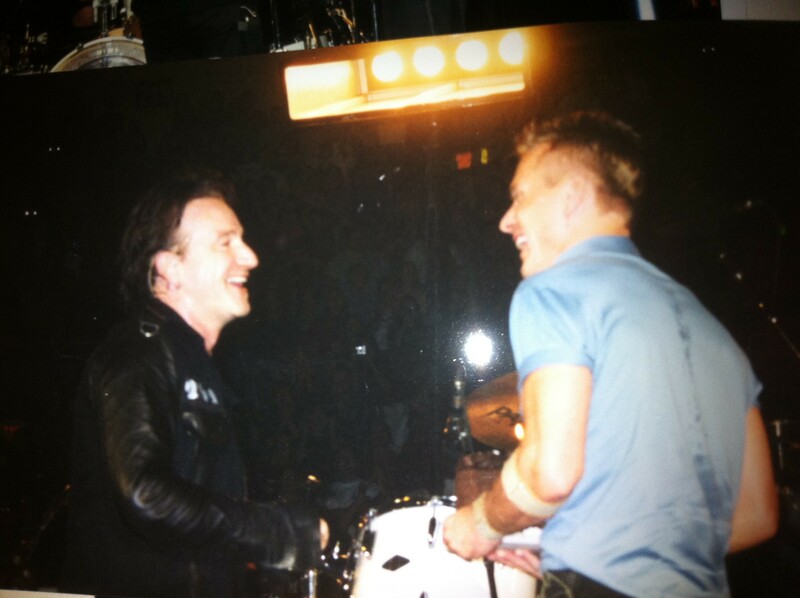 Bono said, “Larry likes chocolate cake.” Larry took the microphone and came to the front of the stage to talk while Bono sat behind the drums. 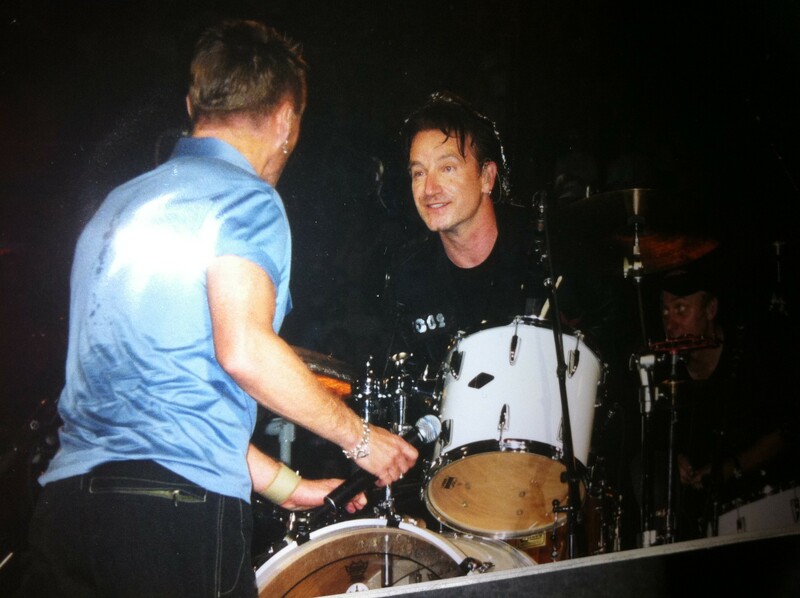 Larry said, “Bono can’t play the drums” then continued with “It took me 40 years to get up front. I’m glad I’m spending my birthday with 18,000 of my closest friends. 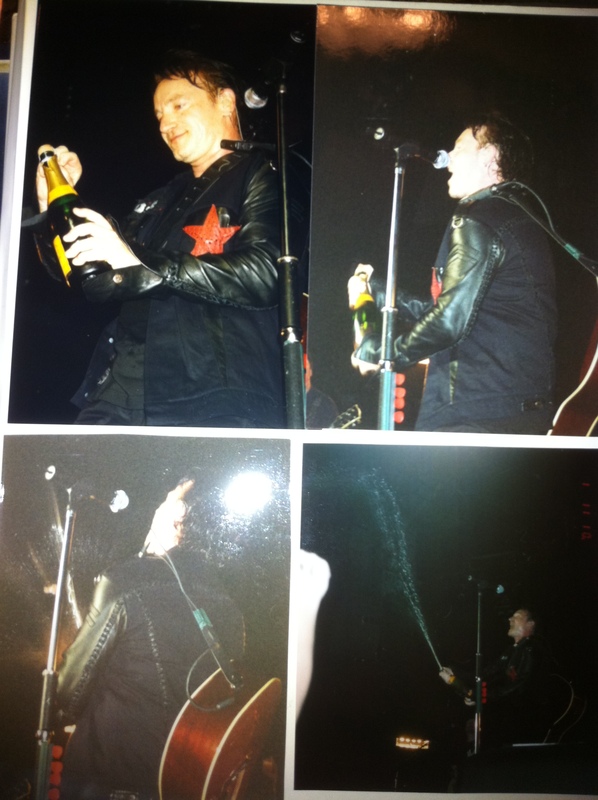 I feel like I could borrow money from you.” Bono asked for a bottle of champagne, which he shook up a la ZooTV and sprayed the audience. Edge took a swig, then Larry drank and continued to drink for the next few songs. After “Pride,” Larry came back over to me so I could give him the birthday card and Elvis shirt. I said, “Thank you. Happy Birthday.” He smiled and said, “Thank You.” It wasn’t much of a conversation, but it was very meaningful as Larry looked into my eyes just as he had in Jersey when he gave me his drum stick a few months prior. Paola gave Larry her Larry scrapbook, which contained the picture of Larry hugging me in Baltimore a couple weeks earlier. 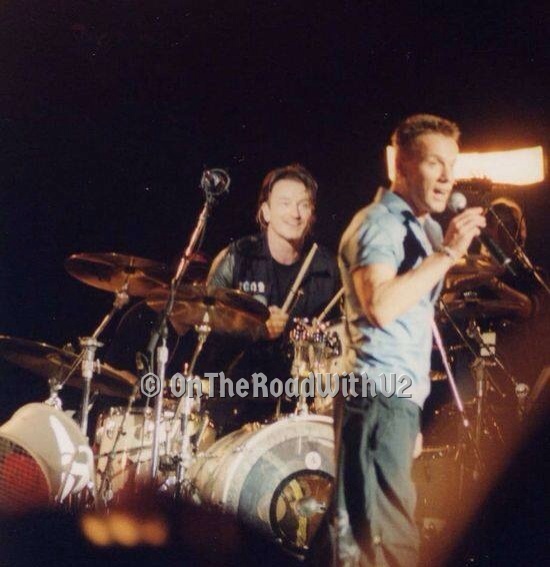 Later on, Bono noticed our “Larry Mullen Band” shirts, shook his head and smiled. 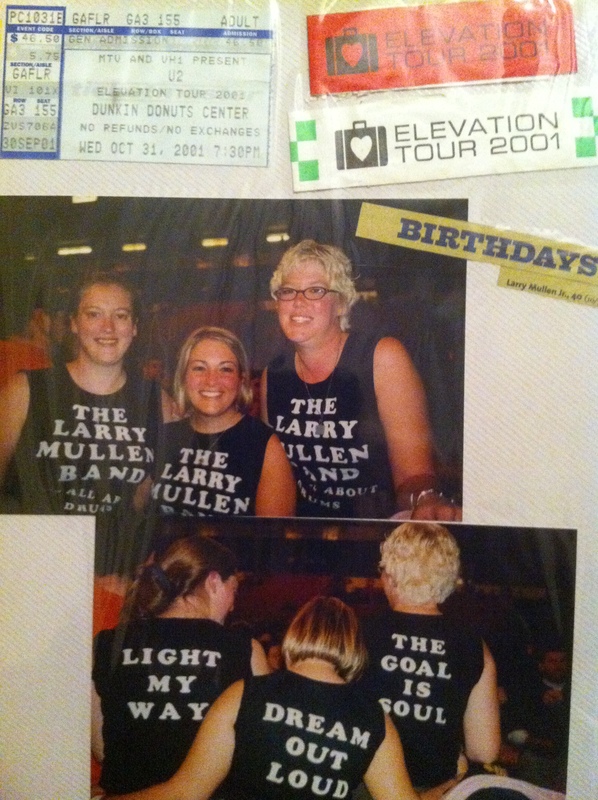 I am pretty sure we were the first to have “Larry Mullen Band” shirts. 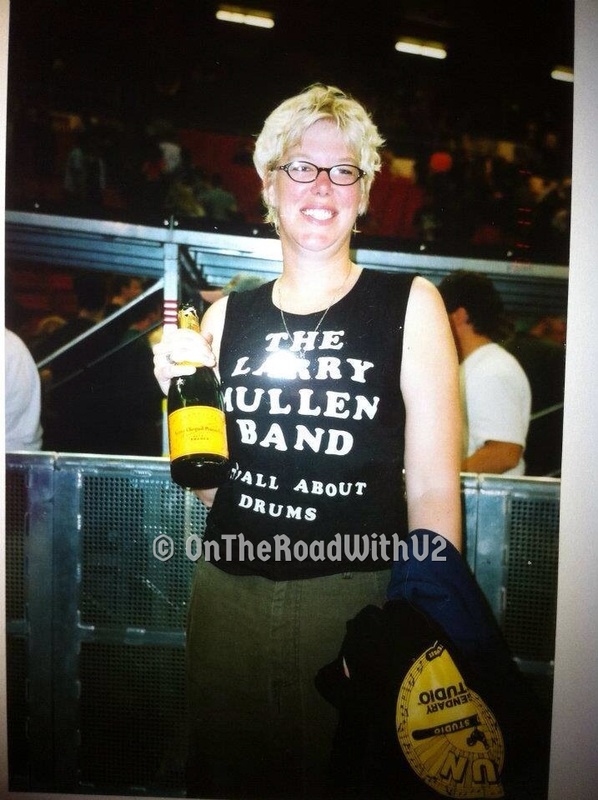 It wasn’t until the Vertigo tour that U2 wore “Larry Mullen Band” shirts on stage, and now many fans wear them. Before leaving the stage Larry took Michelle’s Elvis sunglasses with sideburns and put them on. I was so elated after the show, just walking around hugging Larry’s champagne bottle. The set list for the Larry’s 40th Birthday show in Providence on October 31, 2001 was as follows: Elevation, Beautiful Day, Until the End of the World, New Year’s Day, I Will Follow, Sunday Bloody Sunday, Stuck in a Moment, Happy Birthday Larry, Party Girl, Slow Dancing, Kite, Wild Honey, Please, Bad / 40, Where the Streets Have No Name, I Still Haven’t Found What I’m Looking For, Pride, Bullet the Blue Sky, What’s Going On, New York, One, When Will I See You Again, Walk On. I have had many great concert moments with Larry in the past 14 years since this show, but still that Providence2 Elevation show is my favorite. There was such an unexplainable, fantastic energy that night from both the audience and the band. Granted it was Larry’s 40th Birthday, and I love Larry, but the show was also fantastic for the rarities U2 played that night. “Slow Dancing” was played for the first time on the Elevation Tour, and only the 11th time ever. “Party Girl” and “Wild Honey” were played for the first time on that leg of Elevation, and I have only heard those songs a couple of times ever. 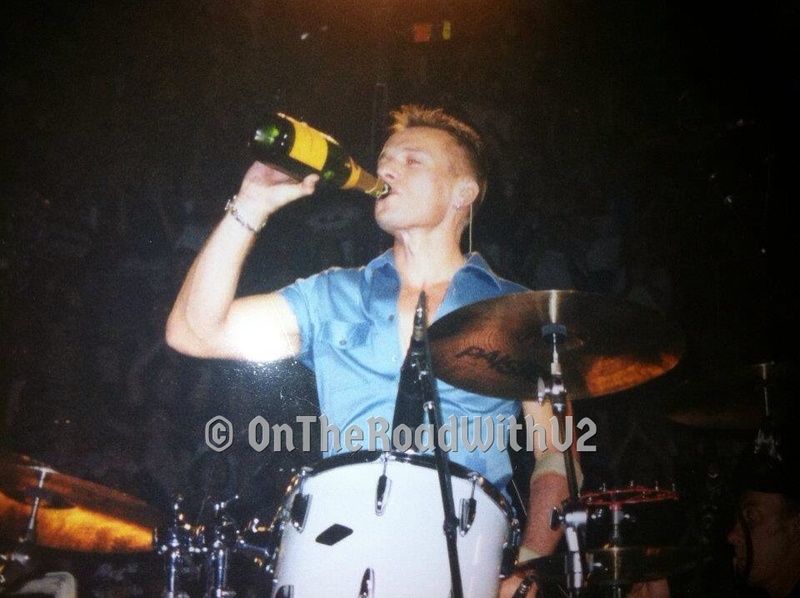 I still have that champagne bottle on my shelf, next to Larry’s drum stick he gave me in Jersey on Elevation and the drumsticks he gave me in Denver on Innocence + Experience. 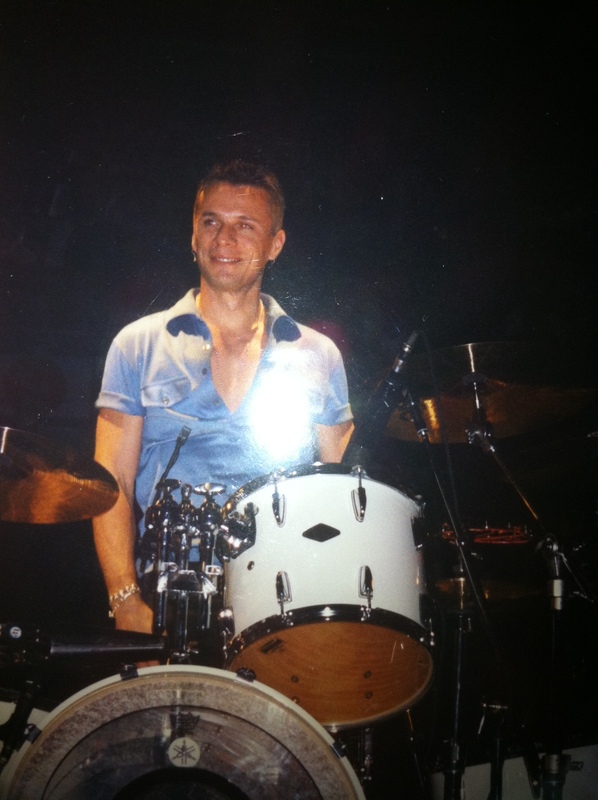 6 Comments on Happy Birthday Larry Mullen Jr! Luv it!! Beautiful memories to last a life time!! I wish you many more with him!! Especially if they come back to the states!!! Thank you 🙂 best concert ever! 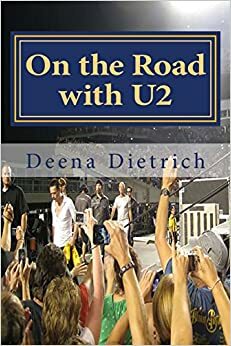 I truly admire the fact that you have been to 50 U2 shows – you are not only lucky to have had so many opportunities to meet the band (and especially Larry) but you also deserved it – you are a truly dedicated fan!! I pray that U2 will com back for a show in Portugal (my home country) one day, and meanwhile, I daily devour their music and all the interviews and videos that I can find on the internet (which is actually how I came across your blog). My all time favourites are the Rattle & Hum videos, especially his interview about Elvis, but also the recording of “Angel of Harlem” in Sun Studios – I loooooove the part where they have to interrupt their playing because Larry is scratching his foot!! Don’t you just adore his smile and the way he laughs?! I could watch this part a million times and never get fed up!!! Thank you again Deena for sharing your wonderful stories – now that I have found a special fan of Larry, I will continue to follow and read you. Thank you very much! no i don’t need to be on stage with them. Larry giving me his drumsticks (as he’s done twice) is more than enough for me!